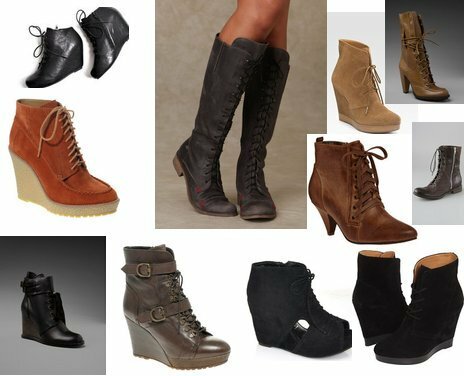 So as autumn slowly makes it's way upon us and I'm planning my fall/winter wardrobe, I've found that I am totally obsessed with one of the big trends for the season--lace-up boots. They come in all forms--knee-hi, booties, wedge, stiletto, etc. Because I'm a mother and also partial to really chic CASUAL style, I find that I'm drawn to the booties the most, preferably in a wedge. Oh, and I also love the Victorian style lace-ups as well. This Fall/Winter, every girl should have at least one pair in her closet!